The blasthole_depth_by_tri.lava script is intended to give the vertical distance between two surfaces at a given point. The distance between surfaces is written to the point name. The script was written so that you could use a pre-mining surface and a post mining surface in association with a layer containing blast hole coordinates to get the blast hole depth plus sub-drill. Using this method, blast patterns are automatically adjusted for ramps or other topographic variations. Copy the file ‘blasthole_depth_by_tri.lava’ into your working directory. Link here. Load the top and bottom triangulations along with the layer containing the blasthole locations. Follow the on-screen prompts to select the top triangulation surface. Next, select the bottom triangulation surface. If you inadvertently select the same triangulation twice you will be prompted to try again to select the bottom triangulation. Click ‘OK’ to close the Error panel and select the bottom triangulation. If you have picked the bottom triangulation twice click ‘OK’ to close the Error panel and right click to cancel selecting triangulations. Click ‘Cancel in the Sub-drill Depth panel and start the script again. Once the triangulations have been selected, the Sub-drill Depth panel will appear. Enter the depth of sub-drill in the panel and click ‘OK. Next you will be prompted to ‘Select criteria to compare elevations.’ Select the layer or group with the blasthole collar locations then select ‘Cancel’ to stop selecting data. The blasthole points will now have a point name specified as the elevation difference between the two triangulations plus the sub-drill. This number will be rounded to the nearest integer. To review the blasthole depth we want to display the point name on screen. 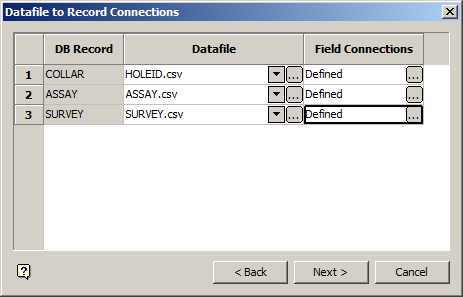 To do this, select the menu option: Analyse > Label > Point Label. Select the layer or group with the blasthole collar locations then select ‘Cancel’ to stop selecting data. The blasthole depth is now labeled next to each collar location. The original elevation of each blasthole has not been changed. The Drill and Blast module in Maptek Vulcan has a similar functionality but this script cost significantly less than the $5,000 Vulcan module. Mate This's the paradise, i really enjoy write scripts for vulcan as well. Continue doing this, this is great!! 1- How can i call or create the create solid by polygon funtion, i'm trying to do this by code, but i don't really get a similar result than the funtion. and i don't really want to use macro for this. 3-this is something that i try for a long time, how can open by code the plot files to be save as a jpg automatically. i try this calling some plots exe file but i just get the postscript file and that is not so prety.